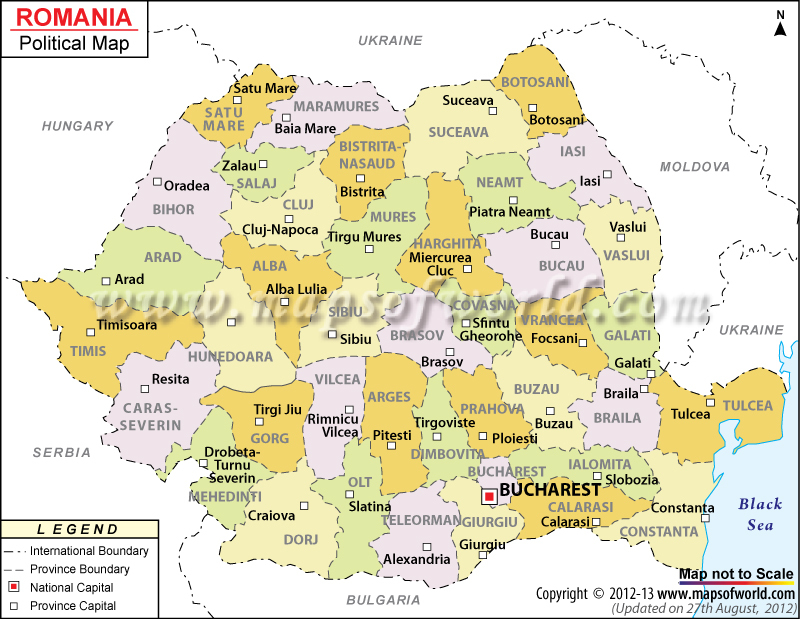 Romania is located in the region separating Central and Southeastern Europe. Located on the Lower Danube, it shares its borders with Hungary and Serbia to the west, Ukraine and Moldova to the northeast and east, and Bulgaria to the south. Adopted on 27th December 1989, Romanian Flag consists of three vertical stripes in blue, yellow and red color respectively. Some of Romania's earliest civilizations were the Getae tribe, of Thracian origins, who lived in the Dacian Kingdom, which included modern-day Romania and neighboring nations. Dacia rose to power in the region beginning in about 82 BCE. Under Trajan's rule, the Roman Empire conquered Dacia by 106 AD, plundering its gold and silver and ruling it until 275 AD. Around that time, the Goths took control of Dacia, until the Huns came along in the 4th century. The Middle Ages brought the division of the region into the principalities of Wallachia, Moldavia, and Transylvania. While Transylvania became part of the Kingdom of Hungary, Wallachia came under Ottoman rule as an autonomous region, with Vlad III the Impaler (Dracula) as its prince in the mid 1400s. Around that same time, Moldavia was ruled by Stephen the Great, who was in power for 47 years and had a serious impact on the region. When he died in 1504, Moldavia too became part of the Ottoman Empire, but the three regions of Moldavia, Wallachia, and Transylvania were under Ottoman suzerainty as autonomous regions. Though uprisings in 1848 by the oppressed Romanians failed to achieve independence, they led to the election of Alexandru Ioan Cuza as the Prince of Moldavia and Wallachia, but not Transylvania, which had stronger associations with Austria-Hungary. With the 1866 coup, Prince Carol came to power in Romania, and after the Russo-Turkish War ended in 1878, Romania declared its independence, becoming a full-fledged kingdom in 1881. Romania is bordered by Hungary, Serbia, Ukraine, Moldova, and Bulgaria, with coastline along the Black Sea. Romania is a southeastern country situated in the Carpathian Mountains, with several high-elevation ranges and its highest point at Moldoveanu Peak, 2,544 meters (8,346 feet) above sea level. The other geographic zones of Romania include the plateaus of Moldavia and Transylvania, and the plains of Wallachia and Pannonia. Romania has large regions of undisturbed forests, which are home to a variety of plant and animal life. The Danube River flows along the border with Serbia and Bulgaria, before emptying into the Black Sea at one of Europe's most important deltas. Romania is also home to the Prut, Siret, Olt, Somes, and Mures Rivers. Romania's largest lakes are the Razelm-Sinoe, while the country is also home to glacial and volcanic lakes. Romania is home to many historic sites and vibrant cities. Its capital, Bucharest features architecture from medieval and neo-classical styles in its historical center and Revolution Square, as well as its Parliament Palace, Atheneum, and the Arch of Triumph. Bucharest also has several ornate churches, like Curtea Veche and the Patriarchal Cathedral. Another major city in Romania is Cluj-Napoca, which is in the Transylvania region. Union Square in the central district of Cluj-Napoca is home to St. Michaels Church and the statue of Matthias Corvinus, while other architectural attractions include the city's Orthodox Cathedral, and the National Ethnography Park. There are also several fortresses and castles around the city, as well as plenty of shopping and dining. Also in Transylvania is Brasov, which is a resort town in the mountains, and the famous home of the legendary Dracula, Bran Castle. Romania's main airport is Henri Coanda Otopeni Airport in Bucharest, followed by Traian Vuia International and Cluj-Napoca International. These airports serve many major cities across Europe, as well as many smaller regional airports. Railway is another great way to get into and around Romania, with service to cities in Eastern and Central Europe, Russia, and Turkey. Within Romania, regional rail is less developed and not as efficient. Since Romania is such a large country, driving by bus or car can take a very long time, and driving in cities can be complicated. Bus tends to be a less expensive way to travel, and taxis are readily available and fairly cheap. In major cities, particularly the capital Bucharest, the public transportation systems are fairly well developed with metro rails, buses, and trams providing a good network.